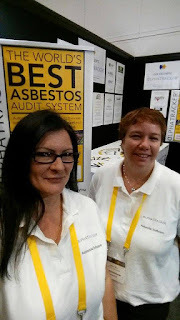 Judy & Leanne are starting to put their stand away for another year after a really successful couple of days at the International Asbestos Awareness & Management Conference being held this year in Adelaide. Leanne (left, in the photo) enjoyed meeting asbestos consultancies interested in streamlining their businesses through the Alpha Tracker asbestos software platform. Consultancies of all sizes benefit from the use of Alpha Tracker with huge savings possible in site and admin time. Judy's focus was on discussing our current and future software plans with asbestos consultancy clients old and new. With more than 15 consultancies already using Alpha Tracker in Australia and New Zealand she is collating ideas for the product and discussing potential improvements and new features to keep Alpha Tracker at the top of the market. Judy also told customers about the new Alpha Tracker App for Android and Apple devices. Thanks to everyone who dropped by and said hello. See you again next year!